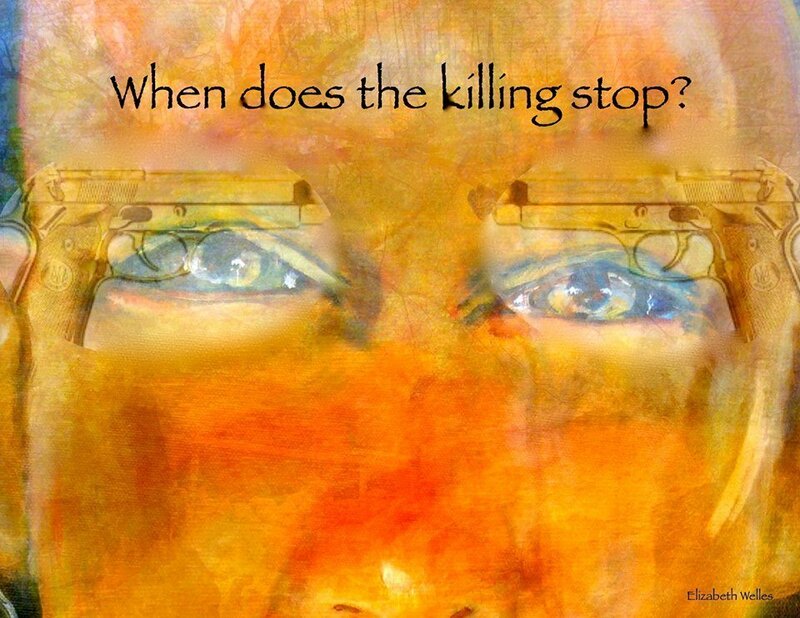 When Does the Killing Stop? I hesitated to post this piece because increasing the polarity is not my intention, but there is a lot of frustration and sadness and wonder of why we don’t have sane gun control measures in this country is. My greater need is to understand. Understand why people are so against having sane gun control measures. It’s not about taking guns away. That will not happen in American society, but why is it that people think they need arsenals in their homes and safes. I don’t get it. I have good friends in this category, as well. My need is to find a bridge, a place where we can talk, find an approach where all sides are heard and find new ways so that more blood is not shed. I met with my mother’s accountant several days ago. She talked about the ”liberals” who are saying we need to legislate and have gun control. In her mind, it was not the time to be discussing such things. “Let the people grieve, it’s not time to talk gun control.” It’s not time. I am one of those liberals. I am a proud liberal who stands for human rights, civil rights, women’s rights, reproductive rights, public education, gay rights, minority rights, the ARTS, immigrant rights, Mother Earth’s rights, religious freedom, freedom of the press, freedom of speech, and sane gun control measures. Just the night before I had been saying to my mom how McConnell thinks we should wait, let the people grieve, it’s not time to talk gun control. It’s not time. Was it time for 58 people to die and well over 500 to be injured? Was it time for 49 to die in Orlando, time for 20 six and seven year olds and 6 adults to die at Sandy Hook, time for Columbine, time for so many countless shootings and killings that we no longer even hear about all of them … need I go on? It is time. There is no time like the present. We can grieve and talk gun control measures, both. It is a place and a way to channel grief and anger into action, which many survivors do. This is what I think. People want you to be silent so you forget and are lulled into sleep again. And you know what? Silencers were taken off a recent bill because the congressman and senators knew it was not time now, right after the mass killing – because it would not get passed now! They will wait till they can sneak things back in bills, later. The NRA is against legislating or regulating bump stocks. We have no background checks and madmen who can get semi-automatic and make automatic assault weapons. In my opinion, the NRA is complicit. People in Washington getting monies from the NRA are complicit. Our legislators who do nothing about levelheaded normal gun controls, when most people in this country want them, are complicit. I thought further … and if it had been a Muslim who did this, T would have been banning everyone from entering and building his wall. If it was an African American, the Nazi’s and KKK would have taken to the streets and there’d be civil war right now. It was a white man who was, in my book, crazy. Understanding motive? Good luck with that. More BS to try to right something that will never be righted without greater help for the mentally unstable and for madmen and psychotics and gun controls!!! In Australia, after a gun massacre in 1996, they instituted the National Agreement on Firearms, (NFA) and the gun buyback program helped reduce gun violence and suicide by guns significantly. Why can’t we do the same? 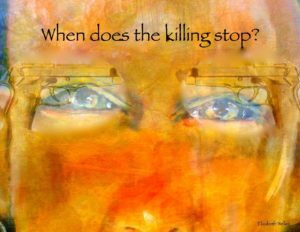 So, I’m posting this image again, When Does the Killing Stop? !